Thanks to your continued generosity, our Church network has already sprung into action and we are reaching thousands of vulnerable people with life-saving food, clean water, and hygiene kits. Caritas aid workers are working around the clock to get aid to where it's needed, a life-line to families made homeless by the flood waters of cyclone Idai. Boats have been loaded up with vital food aid, destined for the remote area of Buzi, where at least 50 families are sheltering in the local parish church. We are also providing 30,000 people with basic hygiene, sanitation and shelter supplies, and services in the dioceses of Beira, Chimoio, and Quelimane. CAFOD and its local aid workers are monitoring the path of Storm Kenneth, which is predicted to make landfall on Thursday (25 March) and into the weekend. “The prediction is Storm Kenneth will make landfall tonight (25 March), bringing with it flooding and mudslides, which could destroy homes and communities across northern Mozambique. “We are closely monitoring the situation and already have local emergency experts on the ground. Our aid team on the ground in eastern Zimbabwe, have told us that access beyond Chimanimani, one of the worst-hit areas is very poor because major bridges have been washed away, but the government is working to try and build a new road. In a 4x4 vehicle our aid Caritas workers have been able to distribute aqua-tabs - a water purification tablet - to support families who have lost their clean water supply. In Chimanimani and Chipinge an estimated 16,000 people are now homeless and in need of shelter. "We have so far buried 40 people who passed on in the church. So far, the church is housing 65 adults and 35 children. We have well-wishers who have been providing assistance but it is not enough to feed all the people." “We think of all the people who have been left homeless and as well as losing loved ones have lost all their possessions, including their crops and livestock. “As Jesus tells us during this season of Lent: “Be compassionate as your Father is compassionate,” let us try to open our hearts to those anguished people. “In whatever way you can, try to assist them through your prayers, your love and through whatever material resources you can share with them in their time of much suffering." “The more we see and hear of the destruction caused by Cyclone Idai, the more shocking is the devastating impact on the lives of children, women and men. Reports from the ground tell us of entire villages submerged and whole families missing. “But there are still lives to be saved and communities who need our help. We cannot waste any time reaching those in urgent need. “We’ve already seen how the Catholic community has responded, here in England and Wales and through our global church network. CAFOD has made an initial £100,000 pledge for Mozambique and £50,000 for Zimbabwe, but much more will be needed as the disaster unfolds. What countries have been affected by Cyclone Idai? Mozambique is described as the worst affected country. The cyclone also hit Zimbabwe and Malawi, destroying homes, roads, bridges, and vital crops, in its wake. Hundreds of people have died, and an estimated 3 million people are now affected and will need support to survive the coming days and weeks ahead. How have families been affected by Cyclone Idai? "I had to grab my three-week old grandson as I thought he would drown. We ran to the school for shelter and had to stay there for four days. We have lost everything – our clothes, the babies’ clothes, utensils, documents." The communities affected by Cyclone Idai rely on agriculture and natural resources for their living. The impact of this cyclone has jeopardised water and food sources. In eastern Zimbabwe, our local emergency experts estimate that at least 16,000 people are in need of shelter. But many districts remain inaccessible, so this number is expected to rise. Anita Lopez Paulo with one of her grandchildren at the distribution of tokens prior to the distribution of food aid and tarps in Tica, Nhamatanda. One of the families to receive support from Caritas was Juan Carlos, 45, his wife Anita Lopez Paulo, 34. The couple have six children and five grandchildren living with them. All their grandchildren are under three, with the youngest only four weeks old. The family have now received tokens that will help them to access tarpaulins and emergency food aid. What is the Church in the affected countries saying? 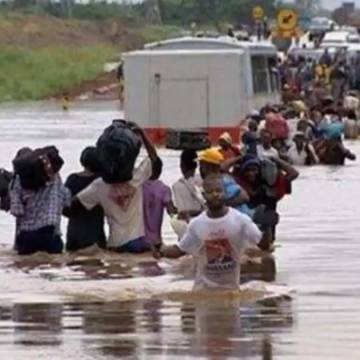 Bishops from Mozambique, Malawi, Zimbabwe and across Africa are calling for prayers and humanitarian aid following the deadly floods caused by Cyclone Idai. In a statement, Bishop Charles Kasonde of Solwezi, Chairman of the Association of Episcopal Conferences in Eastern Africa, called for people to “respond to the cry for humanitarian assistance in whichever way possible”. He explained that the need for humanitarian aid is urgent, as everyone affected is in need of food, clean water, and shelter, with some temporary shelters already at capacity. “I pray for encouragement to all those involved in rescue operations and humanitarian assistance that they may not tire of supporting their brothers and sisters who need them most during this difficult time,” said Kasonde. It isn’t yet possible to say that climate change is directly to blame for individual disasters such as Cyclone Idai or other major storms and floods. But scientists are warning us that the changing climate is making disasters more frequent and more severe. What is clear is that climate change is hitting the poorest people the hardest. The communities which have contributed least to temperature rises are those who are least able to cope when disasters strike. This is fundamentally unjust. To address this, we need to take more action more quickly. CAFOD supporters are calling on the UK government to stop our contribution to climate change within a generation by setting a new and more ambitious target for eliminating the emissions which are driving climate change. We can also help to reduce the impact of climate change by providing people living without access to electricity with renewable energy such as solar panels. This is the safest, most reliable and cheapest way of bringing power to people in poor communities. As well as this, we need to help people in poor areas to reduce the impact of climate change. This includes helping families to rebuild their lives after disasters strike, as we are doing in Mozambique, Zimbabwe and Malawi. Please make cheques payable to CAFOD.